InfoComm 2016 was a milestone for our industry. It was a monster show where we saw control solutions driven from ‘the cloud’, control companies introducing audio DSP products, audio companies showing video products, and every panelist, blogger and manufacturer could not stop talking about AV/IT convergence! QSC launched the Q-SYS AV-to-USB Bridging solution at that show, which was a milestone for us. We legitimately evolved from being an ‘audio company’ into a true ‘AV solutions provider’. In the Q-SYS Platform paradigm, AV-to-USB Bridging involves the multiplexing of network-based audio and video streams into a single AV media stream transported to any computer via USB for integration with ANY soft conferencing application (think Skype for Business, Zoom or Google Hangouts) on ANY host operating system. TRANSLATION: If your computer has a USB port available, Q-SYS can serve up driverless plug-and-play audio and video to your device for software-based conferencing applications. BAM! Part of this introduction was the addition of IEEE networking standards-based video streaming to Q-LAN (the native Q-SYS networking technology). Q-SYS has always provided completely deterministic audio I/O latency, discovery, control and monitoring capabilities. Through standard IEEE networking technology (PTPv2 for those of you interested), Q-SYS now supports deterministic audio AND video, all over a modern IT network. As an industry first, the Q-SYS AV-to-USB Bridging solution leverages network technology for audio/video transport and switching, and uses USB as the final connection to your PC. 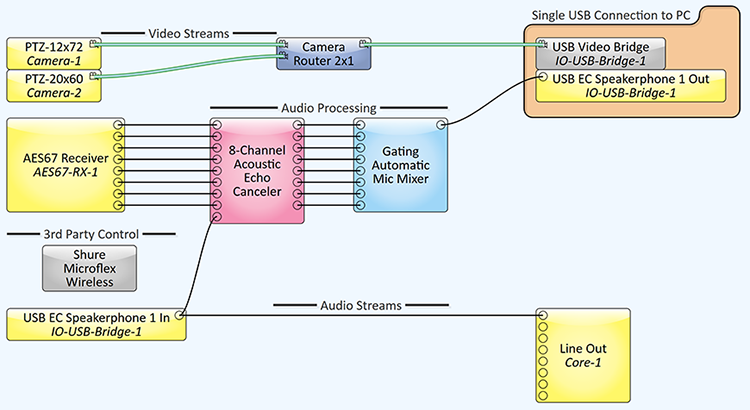 This approach lets us serve up an audio/video stream over USB to multiple computers (installed PCs and BYOD devices) simultaneously. No more point-to-point limitations usually associated with USB! On top of that, our standard network technology allows you to connect as many cameras and bridging peripherals, as you need. Now you can ditch those expensive video matrix switchers and unreliable USB extenders, hubs and switchers. Less equipment, less cost and less points of failure! 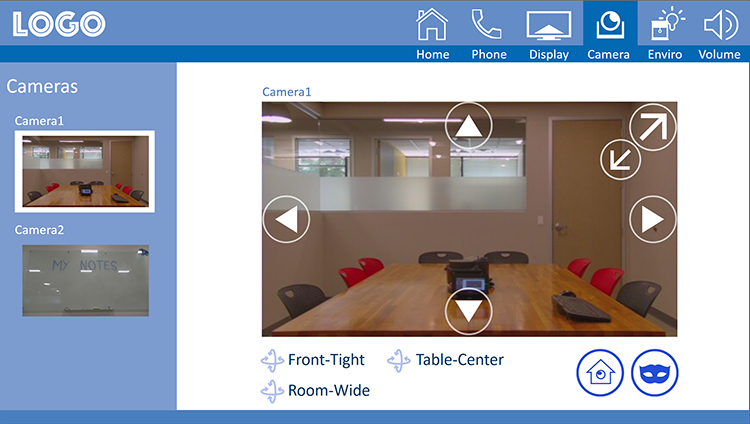 End users can preview, switch and control Q-SYS PTZ-IP video streams using QSC touch screen controllers, PCs and iOS devices. Better yet, designers create the user control interface using the same simple drag’n’drop software they used to design the system! Wanna know the best part? It is shipping today. Experience the flexibility of the Q-SYS AV-to-USB Bridging solution. Request a demo and visit www.qsc.com/bridging for more information.